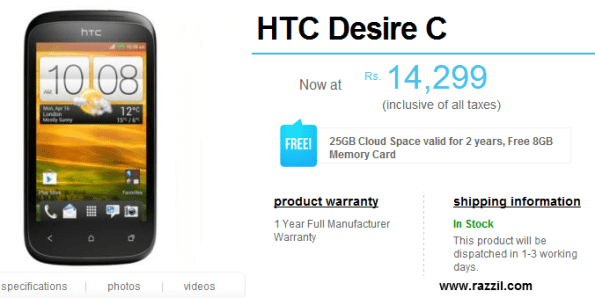 HTC India has silently launched its entry level smartphone HTC Desire C in India for the price tag of Rs. 14,299 with Free 8 GB of Memory Card. HTC Desire C features, 3.5-inch HVGA display with 320×480 resolution, 4GB Internal Storage, 5 MP camera with Auto focus and it runs on Android 4.0 with latest Sense 4.0 UI. The phone has Qualcomm Snapdragon S1 600 MHz processor which is big disappoint for ICS ready phone. I don’t how it able to run ICS + Sense 4.0 UI. Anyways it has 512 MB of RAM. The plus point in the phone is that it has Beats audio and you’ll also get 25 GB of Dropbox space for 2 years. Other features include 3G, Bluetooth 4.0, Wi-Fi and USB 2.0. The phone has 1230 mAh battery. Let me know are you ready to buy this device? How is it possible tha it can run ics with such low config?? ?